Take a look at the CoLAB Planning button on the AskBess.net site to see a brief description of the CoLAB Planning Series process and philosophy. Please let me know if you have questions. It is a fun and challenging process where people learn a lot of USEFUL information about each other! 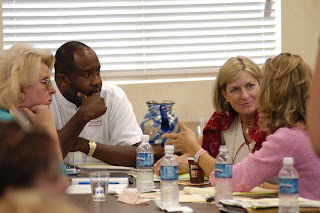 These CoLAB Planning workshop participants are engaged in an idea table exercise to mine ideas that are based on existing assets within the organizations represented: Nonprofit Resource Institute (Community Foundation for Palm Beach & Martin Counties); Palm Beach County Resource Center; and the Jr. League of Boca Raton. 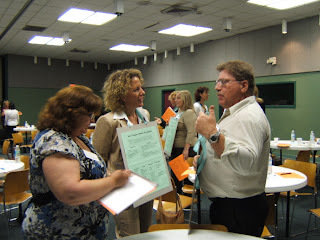 Participants network with each other using a speed dating method that connects people to resources in a large group facilitated process created by Bess de Farber.